This is a project I under took back in 2010 while I was an intern at Milkwood Farm with my mates Bel and Amelie. Have you ever wanted to boil a billy and all you had was a handfull of sticks? (and a few empty cans and a pair of pliers and a pair of tin snips, a can opener and some spare ash?) Well, we sure did. A rocket stove is what you need in this situation! At Milkwood, there’s an excellent rocket stove shower that provides deliciously warm showers every day – all we have to do is keep the stick pile full. Easy! So when our friend Harris showed us his portable rocket stove (that he boils his billy on) we had huge rocket stove envy. Yesterday, we had a spare twenty minutes and felt the urge to build! We had a couple of different models that we incorporated into our design. 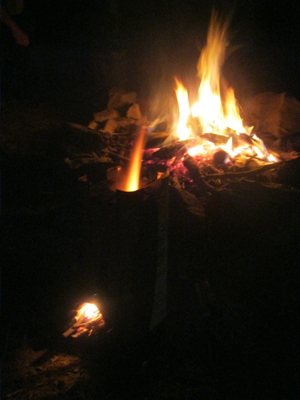 The rocket stove at Milkwood, our friends portable one and some pictures we found on the net were all sources of inspiration. All you really need to do is wrap your head around the basic principles: to direct all the heat energy (from the flames) upward – the heat goes into heating the food, rather than being radiated outward (like most campfires). 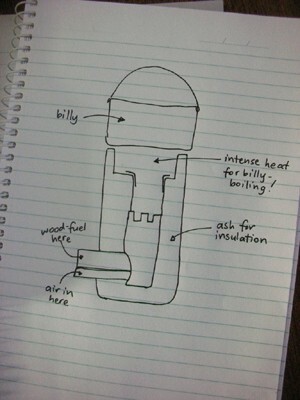 The design also increases combustion efficiency – this helps to reduce smoke. The only problems we faced were with our tin cutting abilities.. we went through a couple of tins before we got the shape we wanted for joining the chimney together. If you’e trying this yourself, maybe find twenty-five minutes of spare time instead of twenty for improved aesthetics.